What is your favorite Hot Wheels car? Eliot Handler, the creator of Hot Wheels, died at his home on Thursday at the age of 95. In honor of the man who created the first vehicle most young car lovers ever owned, we present a special QOTW. What is your favorite Hot Wheels car? Although truly answering this question from childhood would require dusting off the massive collection of Hot Wheels I have sitting somewhere at my parents house, my choice is the last Hot Wheels car I purchased. It's a "Hot Wheels Garage" customized '57 Plymouth Fury. Years of 57-59 Plymouth obsession has made an occasional walk through the automotive toy aisle in search of miniature Forwardlook vehicles a long term habit of mine. Although I'm rarely rewarded with anything, when I do come across one every once in a while the joy of finding one is surprisingly satisfying. I keep the most recent acquisitions sitting on my desk as an amusing way to remind myself of a time when buying every vehicle I wanted was a significantly more affordable proposition. 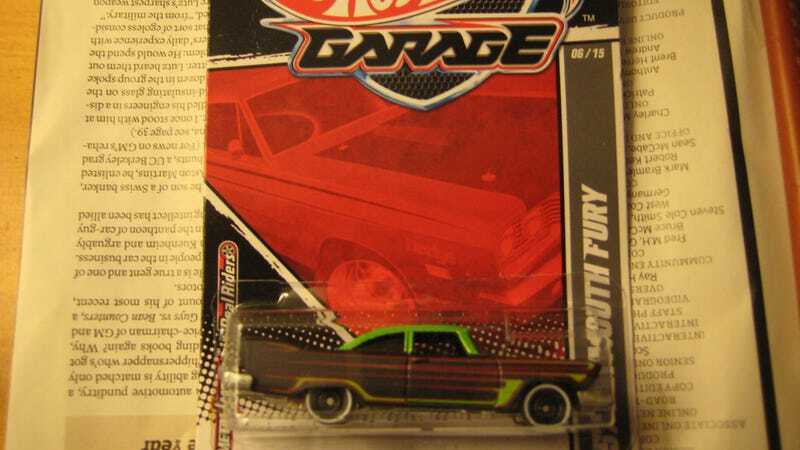 I've told you about my favorite custom '57 Plymouth Fury, so tell us what is your favorite Hot Wheels car?